Father Borislav Kroner was born in Zytomyr, central Ukraine in 1976. Living in the US since 1988 Father Borislav has worked as an EMT at a Boston ambulance company, and investigator at a busy Boston Law firm. Feeling called to God Father Borislav and Pani Matushka Izabela became members of Saint Andrews Ukrainian Orthodox Church in Boston Massachusetts. Shortly thereafter with the blessing of His Eminence Archbishop Antony, Father Borislav entered the Saint Stephen’s Deacon’s Course and later graduated. 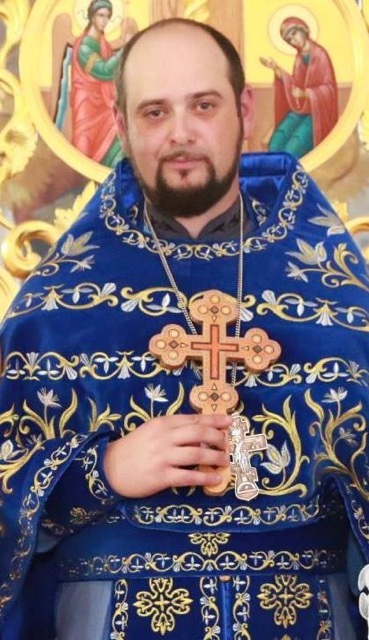 He then entered and graduated from Saint Sophia’s Ukrainian Orthodox Seminary in South Bound Brook, New Jersey with a Master of Theology Degree. His Eminence Archbishop Antony ordained Fr Borislav to the Holy Priesthood in October, 2010. On October the 17th, 2010 Father Borislav was assigned to St Luke’s Ukrainian Orthodox Church in Warners NY, where he served for five years. As of September 14th, 2015 Father was transferred to St Michael’s Ukrainian Orthodox Church in Woonsocket, RI. While Father Boris and Matushka Izabela were sad to leave St Luke’s where they have made so many wonderful friends and memories, they are also excited to continue their ministry at St Michael’s which is a truly wonderful, vibrant and active parish family.